Join us and Lenovo Moms for a Twitter discussion about getting more out of your mobile devices on the road—for work and family travel. 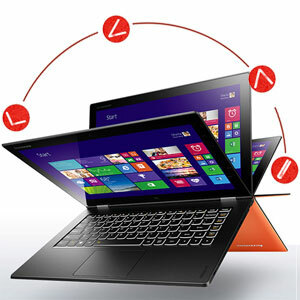 Lenovo's new Yoga 2 Pro laptop helps you get more done with its four modes–stand mode, tent mode, tablet mode and traditional laptop mode. The stand mode is perfect for traditional computing tasks, video chat, watching movies and listening to music. In tablet mode, you can play games, surf the web and keep up on social media. Tent mode is perfect for the kitchen. You can view recipes and even flip to the next screen without touching the touchscreen. With a 9-hour battery, the Yoga 2 Pro will keep you powered all day long. And at just 3.1-pounds, you’ll hardly notice when you put it in your bag. Enter for a chance to win Flex 20 Dual-Mode DesktopYoga 2 Pro laptop! RSVP by commenting below for a chance to win! Enter your name and Twitter handle. To be eligible to win you must RSVP and participate in the event using #techtea. RSVP @AJayHall62 I really hope to win the yoga! I am gonna try to attend, not too savvy on twitter parties for the past year. My RSVP twitter handle is @2sic2mooov. Thanks so much for hosting!